Hamilton further asserts that the Constitution is just the Government the Union needs to remain united. In Federalist #16, Alexander Hamilton argues that the proposed Constitution is the best way for the United States to prevent a civil war. Leaving behind prior discussions of why the United States were vulnerable to enemies and/or internal collapse, Hamilton goes all in on what exactly would lead to war between States. It is interesting to note that although Hamilton claims the Constitution would prevent a internal fighting, everything written in Paper #16 sounds like an eerie prediction of the American Civil War. Hamilton first discusses several examples of historic civilizations who considered themselves confederacies. He points out that even the most respectable of these ended with war between the several governments. In other words, when one government does not abide by the rules of the confederacy, the other governments must force it to by going to war. Hamilton likens the United States under the Articles of Confederation to one of the ancient confederacies, minus the use of force. Therefore, it’s basically nothing at all. Alexander asserts that for the United States to truly act as a Union, it must empower the National Government with an army. This would give it the ability to compel the States to obey laws made at the federal level. If this is not done, he predicts, then groups of States who are in agreement will naturally go to war with States who disagree to force compliance. Hamilton spends a large majority of Federalist #16 speaking of the various means by which a civil war might erupt from a lack of a stronger National Government and Standing Army. The first reaction an Anti-Federalist should have to Paper #16 is the same as stated in the previous paragraph. If revolutions happen anyway, what’s the point of this whole discussion? Isn’t the reason for the Standing Army to prevent such a thing? Furthermore (and more commonly), the Anti-Federalists were certainly afraid of a National Government with a Standing Army. Especially one that Alexander Hamilton is, quite literally, saying will have the power to put down the State Militias should they attempt to resist federal laws. In essence, if the leaders from Virginia, Pennsylvania and Massachusetts all agreed on something, it would (at that time) essentially become law. For other States, for example, New York, this was an extreme idea. If you have missed any of our previous Federalist Fridays studies, you can go through them here. 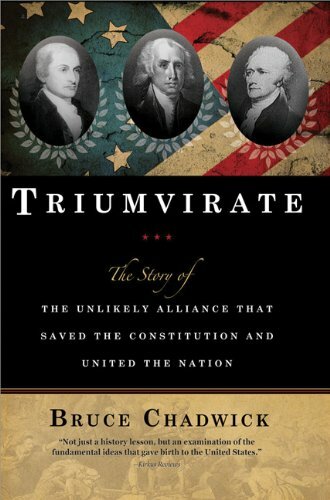 To learn more about the Federalist Papers, I highly recommend picking up a copy of ‘Triumvirate’ which can be found through the affiliate link below. Are you a regular read of Founder of the Day? I’d love to know what you think. What do you like? What do you hate? You can contact me on Facebook or Twitter or send me an email at contact@founderoftheday.com.